From the Bank Format drop down list you can select your bank format. Consult the Bank Formats Available for EFTXpress list to see which bank formats are available. Build your own description that appears on your bank account statement as well as the description that appears on the Beneficiary bank account statement. You can build descriptions of up to three segments from the following fields: Batch Entry Reference, Batch Entry Description, Miscellaneous Code and Miscellaneous Name. A detailed record layout of your EFT bank format which can be obtained from your bank. The name of the EFT Bank Format. This name will be used in the Bank Format drop down on the EFTXpress Bank Codes screen. The serial number of the EFTXpress purchased. Peresoft will only write the interface for the EFT bank format for clients who have already purchased EFTXpress. This will ensure development costs of the new bank format is covered. All new banks formats are automatically included in the updates to EFTXpress which is available to all users within the region. EFTXpress requires additional information for Vendors and Customers depending on which bank format you are using. You are able to enter additional information for multiple banks for each Miscellaneous Code. To link a Miscellaneous Code to an existing Vendor or Customer, use the same Vendor or Customer number that you used in Sage 300 ERP (Accpac) Accounts Payable and Accounts Receivable. 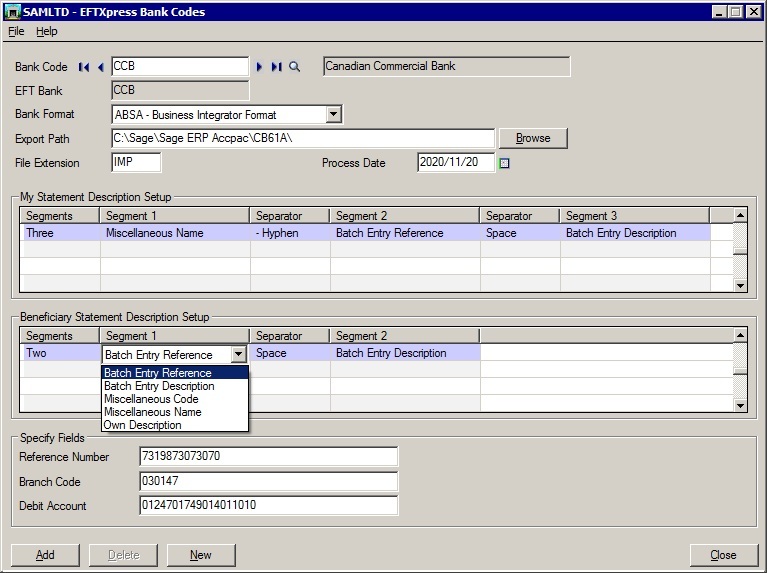 When creating an EFT batch and entering the Vendor or Customer number in Batch Entry, Cashbook will retrieve this information from the CB Miscellaneous Codes table. An extra batch type is now available called EFT Batch. Use this batch type to create an Electronic Funds Transfer file to submit to your particular bank for processing. Security Rights on the EFT Tab in Miscellaneous Codes where Bank Account Payment information for the Vendor is setup. Audit List in C/B Register Reports to print any fields that have been modified in the EFT Tab of Miscellaneous Codes where Bank Account Payment information for the Vendor is setup. Re-generate an EFT File from a posted EFT Batch in Batch List. Useful if you need to update the Account Payment information for a Vendor without having to repost the EFT batch. If the date in Setup EFTXpress Banks is greater than today's date, the setup date is used otherwise today's date is used when generating the EFT file. The list of bank formats available for EFTXpress is increasing all the time as more and more users provide Peresoft with their EFT bank formats to take advantage of the new EFT functionality. Consult the Bank Formats Available for EFTXpress list to see which bank formats are available. Provide us with your EFT bank format and we will add it to the list of formats already available.